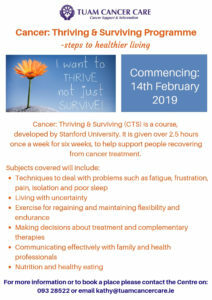 Tuam Cancer Care are running a Free six week self management programme called ‘Cancer Thriving and Surviving’ The progamme consists of 2.5 hour sessions run over six (6) consecutive weeks. 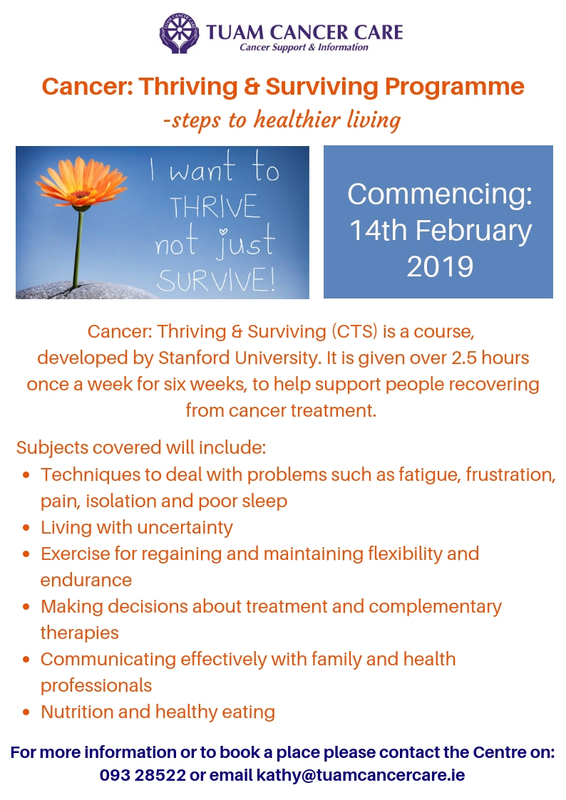 The CTS course will commence on Thursday the 14th of February at 10.30-1pm in the Centre. The workshop aims to help people who are cancer survivors to better manage their health and daily lives. It gives participants the skills to co-ordinate all the things needed to manage their overall health, as well as keep active in their lives and relationships. The programme was developed and researched over 20 years by Stanford University, one of the leading research institutions in the States. It is facilitated by two (2) trained facilitators with their own experience of cancer. For further information or to book a place, please contact the Centre on 093-28522, Booking is essential as places are limited.